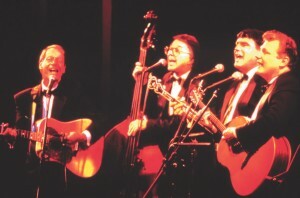 Folk legends The Brothers Four will perform at the Red, White & Blue Gala. The stars—and the Lears—will be out on the evening of June 29, 2002, at the Red, White & Blue Gala at the Museum of Flight in Seattle. This elegant affair, featuring appearances by celebrities and astronauts, will be an all out extravaganza, complete with music by the Brothers Four, a gourmet dinner, a mini-live auction and a tribute to aviation legends Bill and Moya Lear. An incredible fly-by and presentation of the missing-man formation by museum trustees and Learjet owners Joe Clark, Clay Lacy and Bruce McCaw will add to the evening’s tribute. The Lear family is taking part in planning the event. According to Museum patron and astronaut Bill Anders, when Apollo 8 flew to the Moon, the Brothers Four was some of the only music they took with them. Started at the University of Washington in 1956, Bob Flick, John Paine and crew pioneered the musical movement known as “folk revival.” They gained popularity with their all-acoustic presentation and outstanding vocal harmonies. Playing concert halls from Boise to Beijing, the Brothers Four have rooted themselves firmly as legends of traditional American folk music. Items up for grabs in this year’s live auction include a cloth patch worn by James Lovell on Apollo 13 and a 100-bottle Leonetti wine cellar. A high-tech, retro Mini Cooper from BMW Northwest will also be on the auction block, as will numerous VIP private jet excursions and more. The silent auction will include autographed sports memorabilia, fabulous getaways to some of Seattle’s most exclusive boutique hotels, an upscale wine auction, and much more. Bill Lear’s final inspiration was the single-prop, twin-turbine Lear Fan 2100. 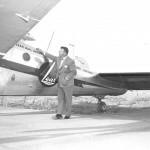 Completed by his wife, Moya, following his death, the Lear Fan’s first flight was recorded on “December 32, 1980,” in order to meet a financing deadline. Students will learn basic principles of aerodynamics and aviation weather. They will study navigation and flight planning using real charts and GPS. They will pre-flight a real light aircraft, seeking to find and correct “faults” introduced by the instructor. And they will be exposed to information on a wide variety of aviation careers. The ALC curriculum, which was developed by the museum using teams of subject-area expert volunteers, is fully aligned with state and national standards for math, science and technology education. The ALC is scheduled to open in October 2002. Proceeds from this year’s Red, White & Blue Gala will benefit a variety of museum youth education programs, ranging from the Challenger Learning Center—in which school groups work in teams to manage simulated space missions—to the museum outreach programs, which took aviation and space educational programs to more than 24,000 students in their schools last year. With music by the Brothers Four, the largest gathering of Learjets in history, a full tribute to Bill and Moya Lear, an upscale auction and an extremely worthy cause, the Red, White & Blue Gala is truly an event not to miss. 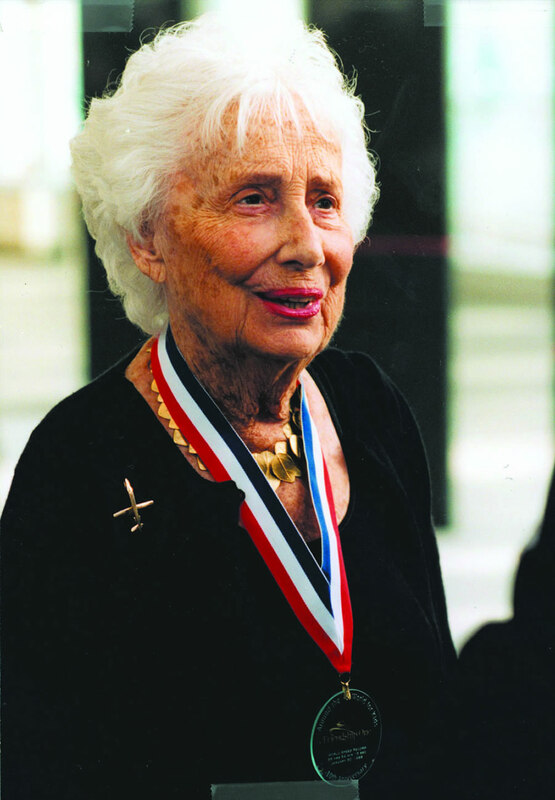 Moya Olsen Lear, a faithful trustee and a great friend of the museum, passed away in December 2001, from complications related to cancer, at her home in Reno, Nev. She was 86. Moya, the daughter of Vaudevillian legend John “Ole” Olsen, distinguished herself through quiet determination, unfailing grace and perseverance. She was a supporter and a strength to both her husband and her father, as well as a respected leader and philanthropist in her own right. 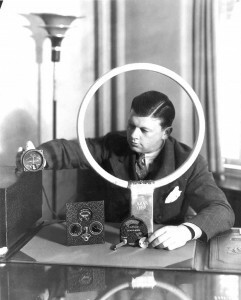 Backstage, in 1938, she met young inventor and entrepreneur, Bill Lear. They were married in 1942. Among many other inventions, Lear originated the car radio, the eight-track tape and the autopilot. He held 150 patents. 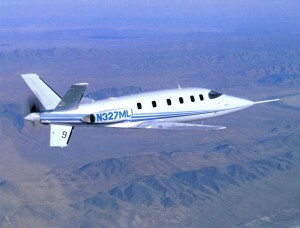 He had a deep love of aviation, and although not a trained aeronautical engineer, went on to create the Learjet. Whether in Europe, Wichita, Grand Rapids, Beverly Hills or Reno, Moya created a home for her husband, raised four children, and remained always her husband’s chief adviser and confidante. When Lear died in 1978, he was developing the Lear Fan—a revolutionary, all-composite turboprop business aircraft that retained much of the performance of a corporate jet at a much lower acquisition and operating cost. His dying wish was for Moya to take over the project and see it through to completion. This she did, serving as an inspiration to the team and taking the aircraft through to its first flight. This milestone was reached on December “32,” 1980, a “date” invented to satisfy the project financiers’ condition that the first flight take place before year’s end. Moya later said that this was the happiest day of her life. One of the three Lear Fan prototypes completed now hangs in the Museum of Flight’s Great Gallery. Before getting involved in aviation, Bill Lear was a prolific inventor of electronic devices, including the “Lear-o-Scope” radio direction-finding system he is demonstrating here. In the last 20 years, Moya devoted herself to writing, inspirational speaking and philanthropy. She was a leading citizen in Reno, was awarded numerous honorary doctorates, and was inducted into the halls of fame of the Women in Aviation Pioneers, U.S. Achievement Academy and Nevada Business Leaders. Just last year, she made the first leadership gift for the Museum of Flight’s $140 million expansion campaign and designated the museum as the permanent home for the Lear Archives. Moya was fond of telling people that she had had an incredible life. Her zest for living is perhaps her greatest legacy. She will be greatly missed. Tickets for the Red, White & Blue Gala are $250 for general level, $500 for patron level and $1,000 for benefactor level. Table sponsorships are also available. To purchase tickets or sponsor a table, please call the Red, White & Blue Gala event line at (206) 764-5709. 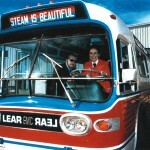 In the early 1970s, Bill Lear (left) experimented with an efficient, environment-friendly steam-powered bus, driven here by his wife, Moya (right). 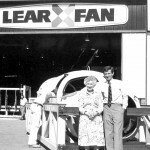 Moya Lear saw her late husband’s final project, the Lear Fan 2100, through to its conclusion. Bill Lear’s first big aviation venture was his “Learstar” executive conversion of the World War II-era Lockheed Lodestar medium transport.